100 sets of stanard samples, storing 100 sets of testing samples under each standard sample, with fresh allocation. This ergonomically portable handheld 60° degree gloss meter is versatile as well as easy to use. 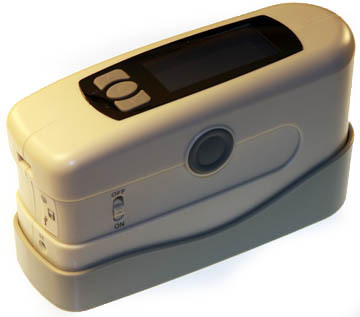 This instrument features a high contrast, back-lit, LCD display with an encapsulated removable calibration reference. The model H200 60° gloss meter conforms to numerous international standards, which includes: ISO-2813, ASTM-C584, ASTM-D523, DIN-6750, and ASTM-D2457. This instrument could store up to 900 measurements with its internal memory. The data can be transmitted via Bluetooth or via USB cable. Carrying case, handy wrist strap, manual, software CD, USB cable, calibration reference and AC adapter. Feedback | Color Theory | Company Profile | Contact Ihara | Report Site Errors | Español | Français | 中文 | ©2016 Ihara U.S. Inc.